Environmental justice is defined as “the fair treatment of people of all races, cultures, and incomes with respect to the development, adoption, implementation, and enforcement of environmental laws, regulations, and policies” in Government Code Section 65040.12. 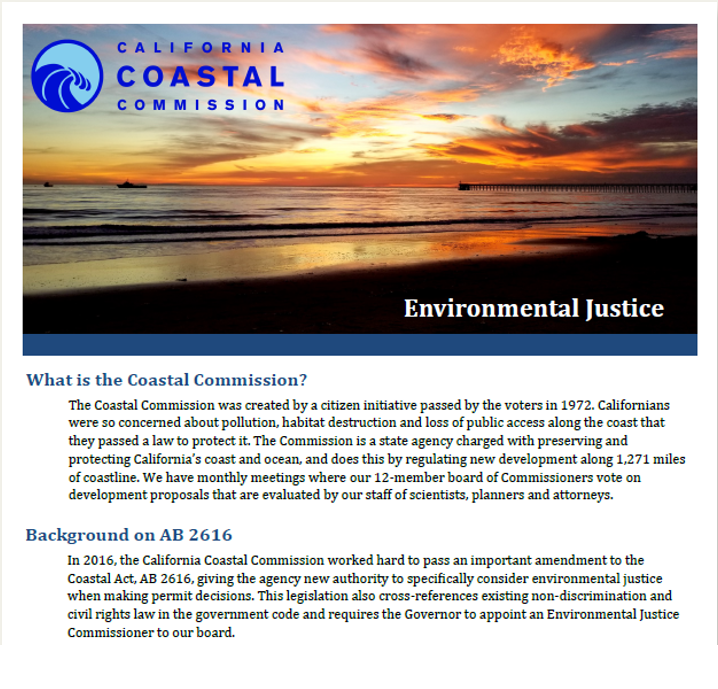 In 2016, the Governor signed AB 2616 (Burke), which amended the Coastal Act and gives the Commission new authority to specifically consider environmental justice when making permit decisions. This legislation also cross-references existing non-discrimination and civil rights law in the government code and requires the governor to appoint an environmental justice Commissioner to our board. Commission staff is currently in the process of developing an environmental justice policy to provide both the public and the Commission with guidance on how the agency will carry out this new authority. Governor Brown appointed Vice Chair Turnbull-Sanders as the environmental justice commissioner in 2017. 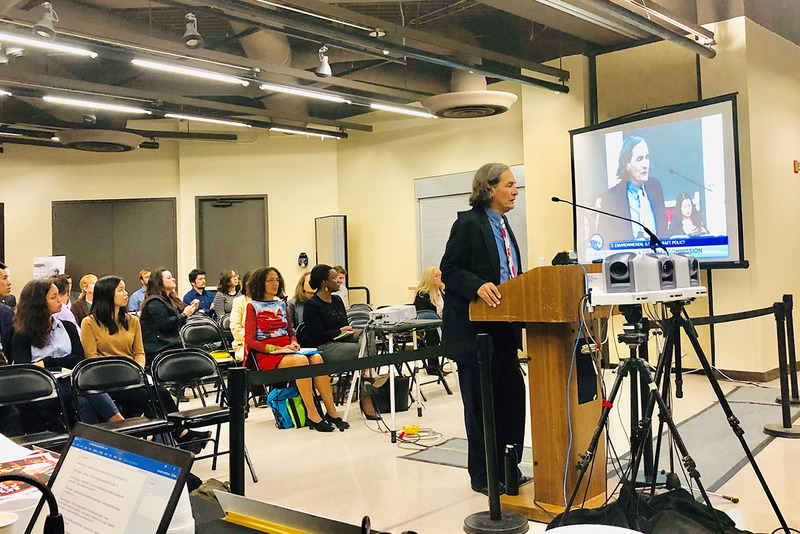 The Coastal Commission adopted the environmental justice policy on Friday, March 8, 2019 at the California African American Museum in Los Angeles. Staff will post the final adopted policy on the webpage in English and Spanish soon. For more information, read the press release or watch the recording of the Commission meeting. Want to stay updated with our work? Currently there are no upcoming events related to the Coastal Commission Environmental Justice work. If you would like staff to attend or host any meetings and events in your community, Please email environmentaljustice@coastal.ca.gov. Time – The Commission hearing begins at 9:00am, but Item W6c will be heard after general public comment, the Executive Director’s report, and Commission Correspondence. 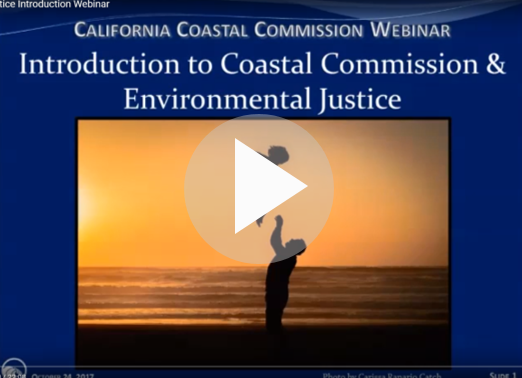 This webinar, originally recorded on 9/25/18, provides an overview of the Coastal Commission’s Draft Environmental Justice Policy released in August 2018. The first 18 minutes of the video is the staff presentation, and the remaining time is audience Q&A. The California Coastal Commission is committed to protecting and enhancing California’s coast and ocean for present and future generations. It does so through careful planning and regulation of environmentally-sustainable development, rigorous use of science, strong public participation, education, and effective intergovernmental coordination. The Coastal Commission acknowledges its role in making California’s coast accessible for all Californians, regardless of their ethnicity, gender, socio-economic status or place of residence. 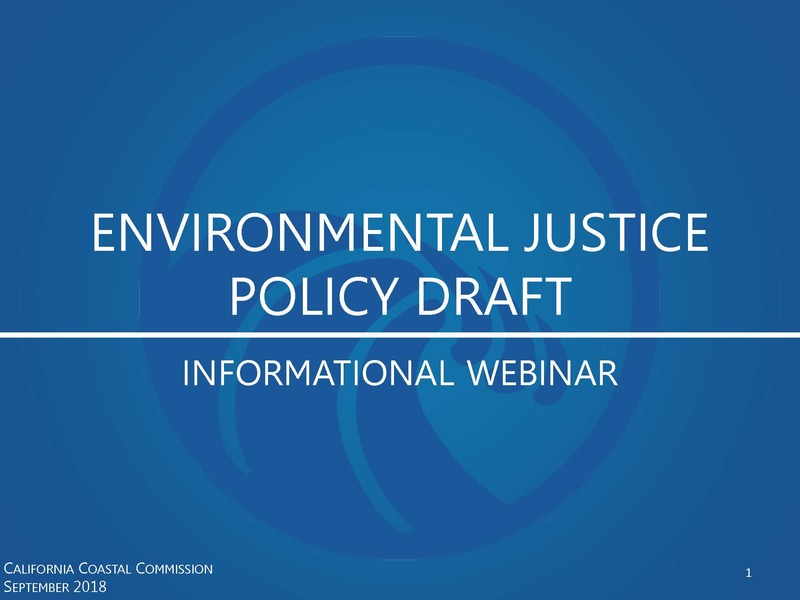 Following extensive public outreach, as well as racial equity and environmental justice training, Commission staff initiated a three-phase approach to integrate the principles of environmental, racial, and social equity throughout the agency. The three-phase approach includes an environmental justice policy, a racial equity plan, and an ongoing five-year strategic plan, of which the environmental justice policy is the leading effort. 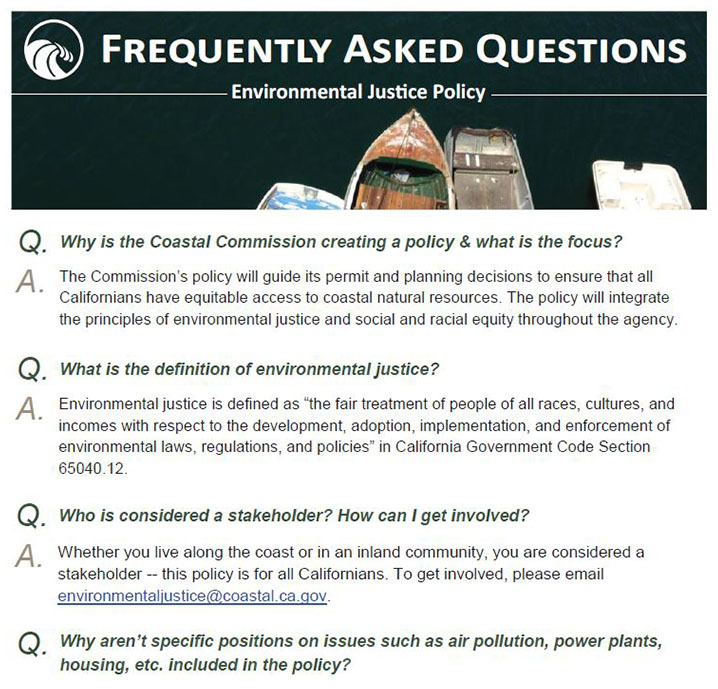 The environmental justice policy will guide the Commission to make even better, stronger decisions that protect coastal resources in an equitable manner. It is not meant to be a rigid list of pre-determined responses to every type of development issue, but rather a framework for identifying and analyzing project impacts on underserved and disadvantaged communities. The policy is meant to achieve more meaningful engagement, equitable process, effective communication, and stronger coastal protection benefits for all Californians. The Tribal Consultation Policy is a separate and distinct policy and process than the draft Environmental Justice Policy. More information about the Tribal Consultation Policy can be found here.